Welcome to our Lucky Emperor online casino review, where we will take an in-depth look at Lucky Emperor. We have all you need to know about Lucky Emperor in this handy online casino review. Lucky Emperor online casino is part of the Casino Classic group and licensed by the Kahnawake Gaming Commission. The casino software from Viper is offered in various different languages including English and French, Danish, German, Spanish, and Italian. It is easy to find your way around The Lucky Emperor online casino and they offer their users various tips and tricks to help guide them. This is particularly useful for novice or beginner players, although everyone loves the fact that this online casino is absolutely one hundred percent user friendly. If for any reason you have more questions or aren’t sure about anything, their client support team will be ready to answer any questions you may have. Their client support team is both knowledgeable and friendly, and always willing to help wherever they can. 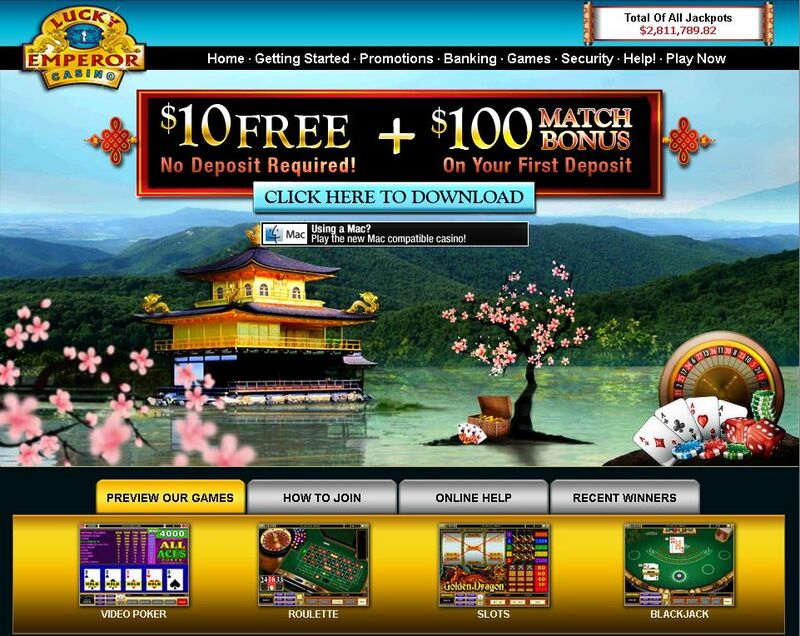 Lucky Emperor offers a $10 no deposit bonus, which offers you the opportunity to ‘try before you buy’ into their casino. They also offer the industry leading Casino Rewards VIP loyalty program. This online casino has a whopping 192 games on offer, which means you will always find something you like whether you like playing slots, table games, card games blackjack, video poker, or parlor games. You can see a preview of their games on their website and they also list their current jackpot levels on their homepage. Beginner players find their site easy to navigate and the games easy to master, while experienced players appreciate the fact that they are taken seriously and that they have other pros to compete with. You can rest assured that your private data is safe with Lucky Emperor casino. They will never give away or sell your personal data, only send you promotional material if you request it, and remove your personal data should you request it. This means that your personal info will always be safe with the Lucky Emperor Online Casino. You can see that Lucky Emperor Casino is ethical, as they are careful about whom they allow to play at their casino. They care about their player’s well-being, not just their bank balance. They therefore ensure that minors are not able to gamble at their casino and they have services that help problem gamblers cool off or exclude themselves. They also don’t welcome players from areas where it’s illegal to gamble online. We have come to the end of our Lucky Emperor online casino review. The best way to discover what Lucky Emperor is all about is to try it out. 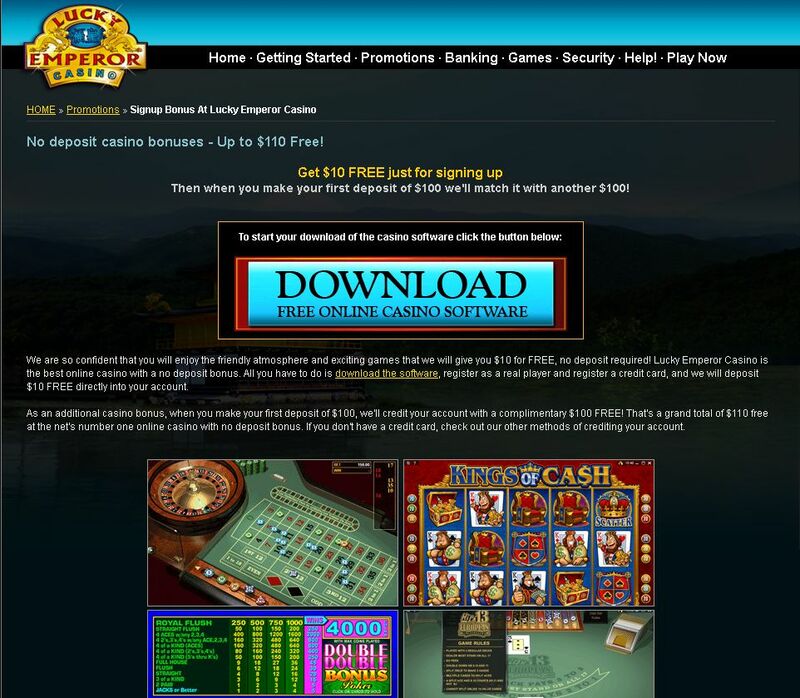 Why not visit their website now and try out a couple of free games to see if you enjoy this casino as much as we have. what are some good no deposit bonus codes for sportsbook.com?